Snow Dome is a mountain located on the Continental Divide in the Columbia Icefield, where the boundary of Banff National Park and Jasper National Park meets the border of Alberta and British Columbia in Canada. The mountain was named in 1898 by J. Norman Collie because its permanently snow and ice-capped massif resembles a dome. The mountain, reaching a height of 3,456 m (11,339 ft), is possibly a hydrological apex of North America, depending on the definition of the boundary between the Atlantic and Arctic Oceans, and of which of those hydrographic regions Hudson Bay is considered to be a part. (The other apex is Triple Divide Peak in Glacier National Park, Montana, United States.) 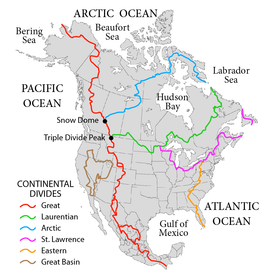 It is a major triple divide between three great drainage basins. Water falling on Snow Dome's summit may flow into streams that drain into the Pacific Ocean (via Bryce Creek, the Bush River and the Columbia River), the Arctic Ocean (via the Sunwapta and Athabasca Rivers), and Hudson Bay (via the North Saskatchewan River). 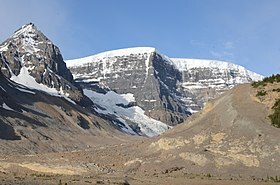 The Dome Glacier flows to the north-east, the Stutfield Glacier to the north-west, the Columbia Glacier to the west and Athabasca Glacier flows to the east of the mountain. A map of North American drainage basins/divides. Snow Dome is noted at the juncture of the Great (red) and Arctic (blue) divides. ^ a b c "Snow Dome". PeakFinder.com. Retrieved 2007-09-02. ^ a b "Snow Dome". Bivouac.com. Retrieved 2013-05-17.